Educational tours are statistically one of the safest environments for students to be in, and risk assessments play a key part in this. Our Risk Assessments Guidance was written in response to the number of Group Leaders that seek help with completing their own risk assessments for their European Study Tours trip. The advice in this guide complements current good practice. You should recognise the importance of always referring to your employer’s guidelines, but here we seek to illustrate, in non-technical terms, common basic principles and how they can be effectively used to benefit your own Group Management Plan. 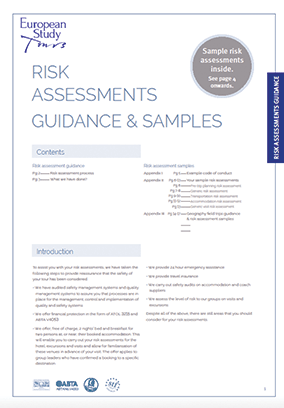 Please remember, whilst there are many ways to complete a risk assessment, the most important thing is that you have taken time to consider what could go wrong and decide on appropriate measures to control the risk. We understand the importance of being as well prepared for your school trip as possible which is why we provide the perfect opportunity for you to explore your destination before taking your group away. We will provide you with two nights accommodation for up to two staff in your chosen destination for you to familiarise yourself with the hotel, conduct risk assessments and perfect your itinerary.